Been studying chess for years and still nowhere near master level? It’s time to focus on the important stuff. Legendary World Champion Emanuel Lasker once claimed any beginner could reach master level in just 200 hours – if they focused solely on critical skills and essential knowledge. Which raises the question: what are those critical skills and essential knowledge? American GM Bryan Smith, having made the journey himself, believes it comes down to 4 factors: calculation, intuitive understanding, concrete knowledge and sports psychology. Been studying chess for years and still nowhere near master level? It’s time to focus on the important stuff. Legendary World Champion Emanuel Lasker once claimed any beginner could reach master level in just 200 hours – if they focused solely on critical skills and essential knowledge. Which raises the question: what are those critical skills and essential knowledge? 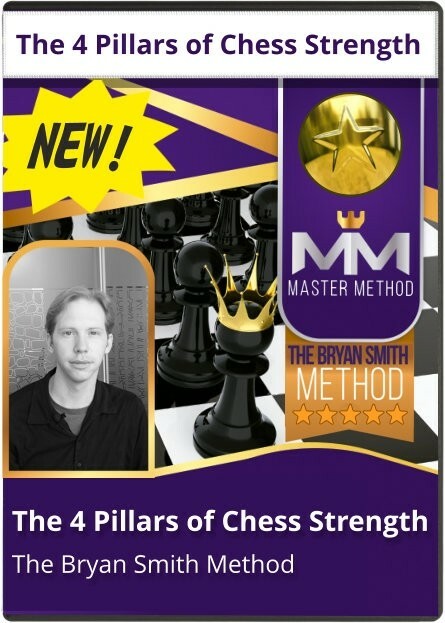 Work on these for 200 hours and you will reach master level – and Bryan details exactly what and how to study in his new course The 4 Pillars of Chess Strength. Unorganized training is like Kryptonite to your inner Superman. Don’t do that to yourself! Calculation: cure yourself of the dreaded “Kotov syndrome” – Bryan’s 3 step approach cuts out the noise, giving you clear sight of tactical solutions in half the time. Intuitive understanding: GMs only have to look at a position to know what’s going on. There’s 2 ways to reaching this level: decades of playing at master level or by studying Bryan’s 13 essential positional components. Concrete knowledge: there’s some stuff you simply have to know. Bryan reveals how to win 85% of endgames using these building blocks of chess knowledge. Master these and you won’t need anything else until you break 2200. Sports psychology: it’s not enough to play a good game, you must also win. Alekhine once said “a chess master should be a combination of a beast of prey and a monk”. Learn how to stay serene while you mercilessly hunt down your rival and become the most feared player around! On top of the video lessons, you get the full PGN (with Bryan’s notes), practical tests and the PDF course summary for easy reference. This course is great--for those who are already masters. Bryan Smith goes into extreme, unnecessary details during the series. The 14 and a half hour course requires you to already have a significant chess understanding.